Did you know that it is incredibly easy to make your own homemade yogurt? Yogurt is loved by baby, toddler, child and adult alike and is actually quite simple to make! Yogurt can be a healthy and natural part of your baby’s diet as well as a yummy “treat” for your toddler. Homemade yogurt may also be incorporated into your whole family’s diet in a variety of tasty ways. You don’t need your own cow, you don’t need to milk a cow, nor do you need your own lab for raising the yogurt starter cultures to make yogurt at home. 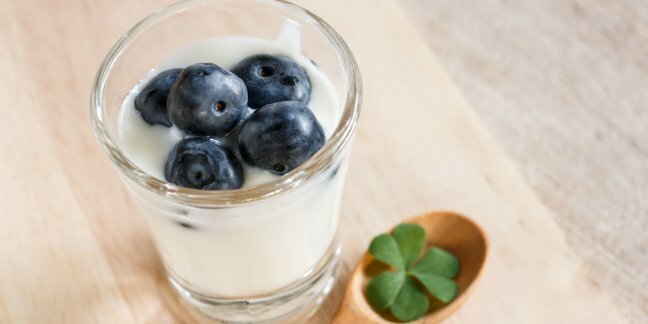 All you need to make fast and easy homemade yogurt is one container of plain yogurt, milk, and a few other things that are already in your kitchen. You can use 3 tablespoons of any plain commercial yogurt with LIVE cultures as your starter culture for homemade yogurt. You may also buy a commercial “yogurt starter” that contains live cultures. Look for these at your local natural food store or in the natural sections of your local grocer. Heat 1 quart milk to about 185 degrees, or as directed by the commercial product’s instructions. Allow it to cool to between 105 and 115 degrees. Stir in the culture and mix well or add 3 tablespoons of any plain commercial yogurt with LIVE cultures. Pour the mixture into a quart jar and put on the lid. Put the quart jar into an airtight picnic cooler with a couple jars of hot water, then close the cooler tightly. Put the quart jar of yogurt mixture into a gas oven with a pilot light. Put the mixture into a thermos bottle. Wrap the jar of yogurt in a blanket. Step 1: Pour the milk into a saucepan and bring to a boil, be sure to stir constantly. When milk comes to a boil, add 1/2 pint of heavy cream, and pour into an earthen bowl or Pyrex dish. Step 3: Pour the mixture of diluted starter into lukewarm milk/cream mix and stir. Step 4: Wrap the warm milk (with yogurt starter), and leave it in a warm place, undisturbed, for at least 8 to 10 hours. (See above for methods to keeping the yogurt warm.) Yogurt should be set by then. Place pot in refrigerator until cold, and ready to serve. When is the Homemade Yogurt ready? You should check the yogurt in four to six hours or 8-10 depending on the recipe you use and/or the yogurt maker you purchase. You should see that the curd is formed. When the homemade yogurt curd has formed, put the yogurt in the refrigerator. A little whey may form around the edges (the liquid you often see in containers of commercial yogurts is the whey.). You may stir in the whey or pour it off. The whey will give you some extra nutrients so stirring it in is a good option. To flavor homemade yogurt for your baby, stir in some fruit purée’s, some vanilla, or other spices that you think your baby may like. Make sure the label indicates “Live Active Cultures”. Check the expiration date. Yogurt culture becomes weaker over time. Use only plain yogurt as flavored/sweetened varieties will not work. Make sure all utensils, container and lid are clean. The smallest specs of dirt may affect the growth of yogurt culture. You should always add any flavoring, sweeteners and fruit after the processing and refrigeration of your homemade yogurt. If using raw milk or pasteurized milk that has been refrigerated for some time, boil it for a few minutes before cooling to the desired temperature. Boiling kills any bacteria that can interfere with the incubation of the yogurt cultures. Whole milk makes the thickest, creamy yogurt because it contains the most solids. If using 2% milk, you may try and add ½ cup of powdered milk per 2 quarts of 2% milk to help thicken the yogurt. Goats milk may be used to make yogurt (note goat’s milk does contain lactose so it may not be a good substitute for a baby or adult who is lactose intolerant) should be treated as skim milk. Soy milk may affect consistency of the homemade yogurt as it does not contain all the fats of cow milk. Commercial pre-made soymilk that has added sweeteners such as fructose, malt or honey is required to allow the yogurt culture fermentation process to take place. Do not use soy milk powder. Milk powder mixture doesn’t need to be brought to boil, just to the 100°F to 110°F temperature.